One of the least attractive features of the English countryside is the number of pointless road signs and indeed signs in general. The single worst aspect of this fact is unfortunately as England has become, daily it would seem, a bigger and bigger ‘Nanny State’ local governments and literarily anyone who has spare cash to burn has erected a sign. 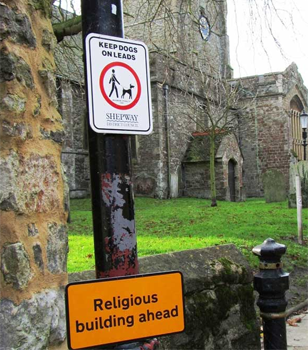 There is, as you can see from this one below, little point to the signs which usually state the obvious (or “bleeding obvious” as I heard the Vicar say). Currently the valiant, but useless Don (Quixote) Cameron, Prime Minister of the UK has said that his government will do everything they can to stamp out useless signs and I expect there is a sign posted on a billboard somewhere saying just that!